Cape Coral Vacation Rentals are one of the key elements of success for Sanford Realty, Inc. As a Brokerage we are in the business of buying and selling Real Estate for our clients; however, many vacationers who rent one of our beautiful, captivating Florida Villa’s return, and this time they return as buyers! As a service to our investors we offer full service Cape Coral Vacation Rentals: we advertise the home internationally, we take responsibility for property management, we watch and take care of the home as if it were ours, and we perform guest services. Cape Coral Vacation Rentals make this community thrive; investors from all over the globe buy Real Estate in this area, thereby increasing home values, while on the other hand thousands of tourists, more and more each year, come here to enjoy the climate, the beaches, and the safety of Cape Coral. Cape Coral Vacation Rentals are an easy to way to feel at home during your holiday, enjoy a private pool, and have all the advantages of living in a single family home in a safe neighborhood. Just book a home online and look forward to the vacation you have always dreamed of. For investors: what better way is there to watch your investment grow than Cape Coral Vacation Rentals? There is a vacation home waiting for you in one of the most desired areas of our world and during the times you can’t stay there it generates money for you. 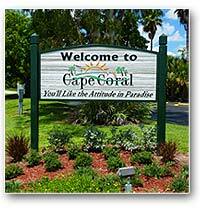 Cape Coral Vacation Rentals – Is there a better deal? 6. Why should Sanford Realty be your Choice?